Pic is Louise Brooks (and here) as Lulu in Pandora’s Box, a classic German silent film. It’s Christmas! We have shared the family rituals, waffles on Christmas day followed by a screening of Galaxy Quest. We have finished our Christmas dinner and are about to start a DVD marathon. Bliss. 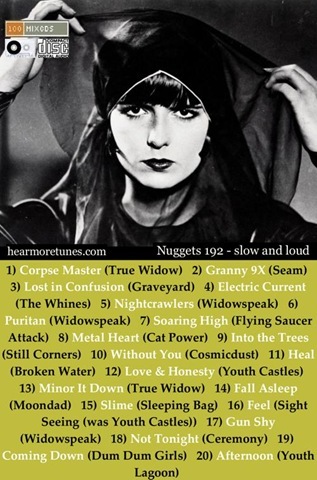 Highlights in this mix include Cat Power from her slo-core album Moon Pix recorded in Melbourne in eleven days with backing musicians Mick Turner and Jim White of the Dirty Three, True Widow with some heavier slo-core, Molly Hamiliton from Widowspeak, and Karianne from The Whines who have a similar snooty shtick with grungy guitar, Youth Castles / Sight Seeing with more 90’s grunge, Shoegaze from Seam, Flying Saucer Attack, Still Corners, Cosmicdust, and Ceremony, then Dee Dee giving it her all with Coming Down before Trevor Powers aka Youth Lagoon sings us out.